Description: Newly arrived, still in Adirondack RR paint. Description: This wheel was the reason NYSW 104 was set out at Susquehanna. Looks like it was dragged a good distance. Description: This RS 3 was set out at Susquehanna with a flat wheel. It must have been dragged quite a distance, judging by the flat spot several inches long on the rear truck. Title: NYS&W RS-3 #104 with a "fake train"
Description: Nice looking RS3, wish Id seen it actually run. Description: Would have liked to have seen the 104 run once. Description: Another unit that will not run for the NYSW again sits in the yard. Description: A C420 and RS 3 cool it at the Binghamton yard. The car to the left of 2010 is NYSW 509-the "Popemobile" theater car, its big rear window covered over while not in service. 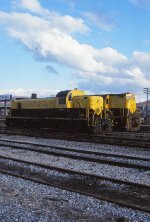 Description: A pair of Alcos from two generations sit in the NYSW yard under a big sky. Description: NYSW 104 sits in the middle yard, out of work for the last time. Sept. 1989, exact day unknown. Description: Sad day as the most recent iteration of the Rome Locomotive Works has shut down, leaving various units scattered about the property. Description: NYSW 104 and CVL 4088 at Peninsula, this was once the yard on the CVSR back in the day at one point.